Disney has certainly been utilizing as much of the Star Wars brand as they possibly are able to every since they purchased the franchise. They have been pumping out blockbuster after blockbuster in theaters across the world, and WOW have they been entertaining. For years their Star Wars Weekend has always been one of the most anticipated, attended, and wildest weeks of the year, as thousands of park visitors show up in the favorite character's cosplay. However fans have long hears rumors, and have been waiting, for the soon to be unveiled Stars Wars Land and Star Wars Hotel. The new Star Wars Land, which will be called Star Wars : Galaxy's Edge, is currently under construction, and should open a little before the hotel. We already know that it will be 14-acres of Star Wars mania, and will be located in Disney's Hollywood Studios. For those unfamiliar, the Walt Disney World Resort has 4 major theme parks: Magic Kingdom, EPCOT, Disney's Hollywood Studios, and Disney's Magic Kingdom. There's been a ton of building and expansion happening at Disney's Hollywood Studios, and we've just learned that the wild Star Wars Hotel will be located next to the newly expanded parking lot. We are also told that there will be some levels of inter-connectivity between the hotel and Galaxy's Edge. Currently, there are more than 25 Disney Resort hotel locations at the Walt Disney World Resort, and there are promises that this hotel will be something unique and special. For example, guest rooms WILL NOT have windows to the outside world. At least not to the outside world of Florida. 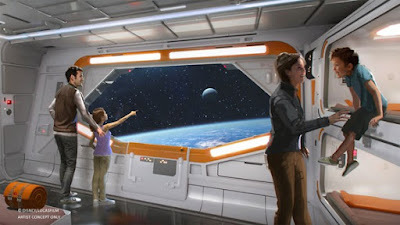 Rather, guests will have visions and views of deep space and the outer Star Wars Galaxy. "All crafts, prepare to jump into hyper drive. On my mark!"